Unfurling 'Sweet Home Alabama,' A Tapestry Of Southern Discomfort More than 40 years after its release, Lynyrd Skynyrd's Sweet Home Alabama is still one of the most recognized rock anthems celebrating the deep South. It's also a song with a complicated legacy. 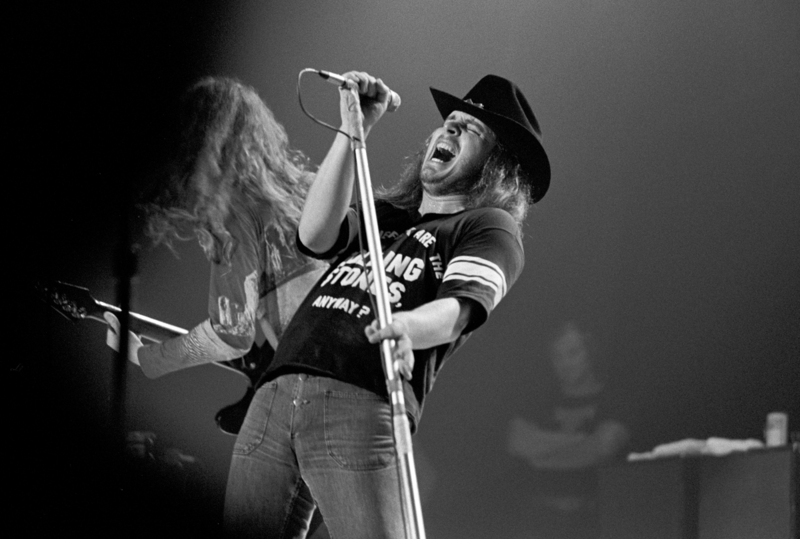 Ronnie Van Zant in 1975, onstage with Lynyrd Skynyrd at the Omni Coliseum in Atlanta. It starts with one of the best known guitar riffs in rock and roll. What follows is a down-home ode to the state that is known as the heart of Dixie: folksy colloquialisms, eternal blue skies, family. Pretty simple, right? Maybe not. Lynyrd Skynyrd's "Sweet Home Alabama" cracked the Top 10 back in 1974. Since then, it's become a kind of anthem for the state and the fight song for for the University of Alabama's Crimson Tide football team. But its history and meaning are complicated. In a way, the song began as a contradiction: It was written by two guys from Florida and one from California, none of whom ever lived in Alabama. So where did members of Lynyrd Skynyrd get the gumption to write about a state they had only driven through? In part, it was because a Canadian got there first. Neil Young's song "Southern Man," released in 1971, took the entire South to task for the bloody history of slavery and its aftermath. In the Showtime documentary If I Leave Here Tomorrow, one of the song's composers, lead vocalist Ronnie Van Zant, explained that the musicians wanted to counter what they saw as Young's one-dimensional stereotype. "What are you talking about, you know?" Van Zant said. " From what I'm told you were born in Canada." Even as the song was positioned to dispel some stereotypes of the South, the band was embracing others. Back then, Lynyrd Skynyrd performed in front of a large Confederate flag — at the suggestion of its record label. And in the documentary, Van Zant offered this: "Everybody thinks we're a bunch of drunken rednecks ... and that's correct." So which is it? Mark Kemp, originally from Ashboro, N.C., offers one perspective; he's the author of a book called Dixie Lullaby: A Story of Music, Race and New Beginnings in a New South, a memoir about his relationship with rock and roll from the region. "At the root of it is a very human dilemma of bigotry and stereotyping," Kemp says. "The South embodies that. So it's never going to go away. It's an integral part of our nation's history." Neil Young took his lumps, eventually. In his 2012 autobiography, he stated that he deserved that musical jab, writing, "I didn't like my words when I wrote them. They are accusatory and condescending." Now we all did what we could do"
In 1963, when he was elected to his first term, Wallace famously said, "I draw the line in the dust and toss the gauntlet before the feet of tyranny, and I say segregation now, segregation tomorrow and segregation forever." Skynyrd guitarist Gary Rossington co-wrote "Sweet Home Alabama," and in the Showtime film he addressed that line. "A lot of people believed in segregation and all that. We didn't. We put the 'boo, boo, boo' there saying, 'We don't like Wallace,' " Rossington said. But he also added that there were "a lot of different interpretations. I'm sure if you asked the other guys who are not with us anymore and are up in rock and roll heaven, they have their story of how it came about." That's another thing: The definitive take on the meaning of "Sweet Home Alabama" may have left the world decades ago. In 1977 — just three years after the song hit the airwaves — three members of Lynyrd Skynyrd and their road manager, as well as a pilot and copilot, died when their chartered plane went down. Ronnie Van Zant was among the dead, and he remains the ghost in the room when the intent of the song is discussed. For Merry Clayton, the song's meaning was crystal clear. She was an in-demand background vocalist who famously recorded with The Rolling Stones, Joe Cocker and Ray Charles. She remembers her reaction when she got the call to do the "Sweet Home Alabama" session: "I really don't want to sing anything about Alabama after what happened in Alabama." Clayton is African-American, and says she could not stop thinking about the infamous 1963 Ku Klux Klan bombing of a church in Birmingham. "I said four little girls lost their lives, and it just broke everyone's heart. I said I don't want to sing anything to do with Alabama. And I went on and on and on." And yet, there she is on the finished track. I asked Clayton if appearing on the record was a way of laying claim to it — of saying, "My experience is part of the Alabama experience as well." Her response? "Absolutely. You got it." Some still insist that Southern pride, absent the racism, is what "Sweet Home Alabama" is all about. At a concert featuring the reconstituted Lynyrd Skynyrd in Kansas City, fan Nick Paul was tailgating outside before the show. "It's honestly an American anthem — it really is," he told NPR. "I feel like that personifies a lot of America. I don't think you can go to a party and play that song without everybody singing along." Dr. Henry Panion III thinks so, too. He's a composer and professor of music at the University of Alabama at Birmingham, who recently arranged the song for marching band and symphony orchestra. Panion is also African-American. "What they were trying to do when they wrote it was say, 'Everybody's talking about the South, but there are some wonderful things about the South,' " he says. "And everyone don't necessarily subscribe to the policies and practices of bigots and racists." For some, the passage of time has muted the song's ambiguity. Panion says he could see going one step further to reclaim "Sweet Home Alabama" as an anthem for all Alabamians. "Maybe I should program that song in February, during Black History Month," he says, laughing. "And then maybe we can begin to change how it's being used." You have to wonder what Ronnie Van Zant would have thought of that.